NVIDIA has finally announced its lineup of RTX GPUs for laptops at CES 2019. 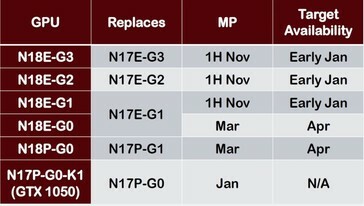 Coming under the N18 family, these GPUs will be available in both standard and MaxQ variants. The RTX 2080 and RTX 2070 will be coming in a total of three variants each — one standard and two MaxQ variants. NVIDIA said that over 40 notebooks from various OEMs will powered by the new mobile GeForce RTX GPUs and are slated be available starting this January. At CES 2019, NVIDIA CEO Jensen Huang unveiled the mobility RTX GPU lineup based on the new Turing architecture. These GPUs come under the new N18 family and are fabricated on a 12 nm process with support for DLSS and real-time ray tracing. The mobile RTX GPUs come in both standard and Max-Q variants. 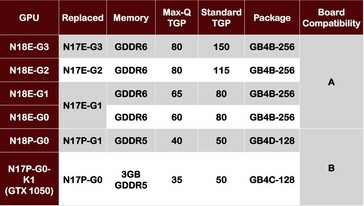 These variants differ primarily in terms of TGP, clock speed, and memory clock. The top-tier mobile RTX 2080 (N18E-G3) and RTX 2070 (N18E-G2) come in a total of three variants — one standard and two Max-Q versions. The tables below indicate the Turing GPUs succeeding their Pascal counterparts. Interestingly, while the GTX 1050 Ti gets a Turing successor with the N18P-G0, the GTX 1050 will likely continue as a Pascal card with a new 3 GB GDDR5 version that will be available in standard (50W TGP) and Max-Q (35W TGP) versions.